Well, hello there and welcome! Overview The Alexa Gadgets team was formed in 2016. Alexa Gadgets are fun and delightful accessories, which can pair to compatible Echo devices via Bluetooth. 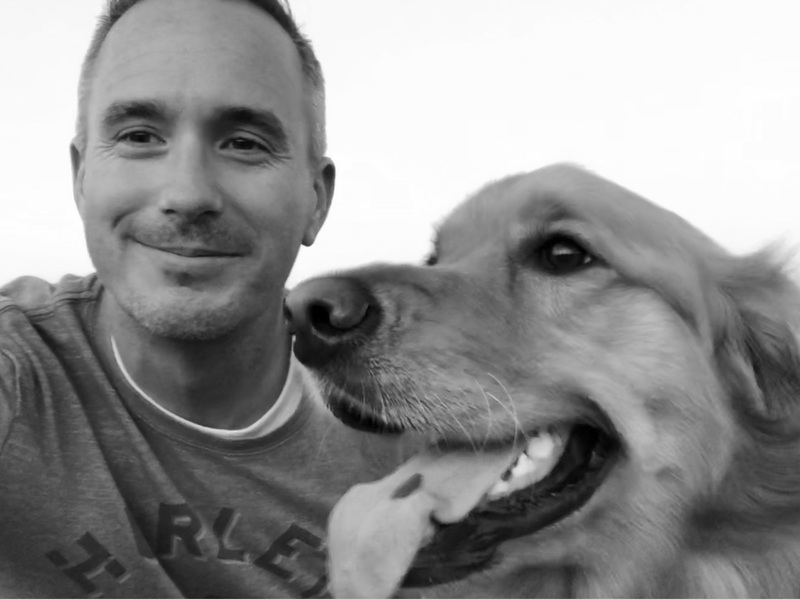 As a new team, I was not only tasked with building out the UX group, and defining the CX for the Alexa Gadgets Toolkit, but I also spent my early days on the team as a product manager, working with different partners to help bring new gadgets to market. Our team was responsible for not only creating first party reference gadgets, but also building out tools and services to enable developers and manufacturers to create their own gadgets. Destiny Skill and Ghost I took on the role of PM for the initial scoping and definition of the Bungie/Activision effort to deliver a Ghost gadget and companion skill for Bungie’s Destiny 2 console game. This was the first integration of an Alexa skill into a major console game. I coordinated design efforts between Alexa Gadgets, Bungie, Activision, Idea Planet, and AKQA. 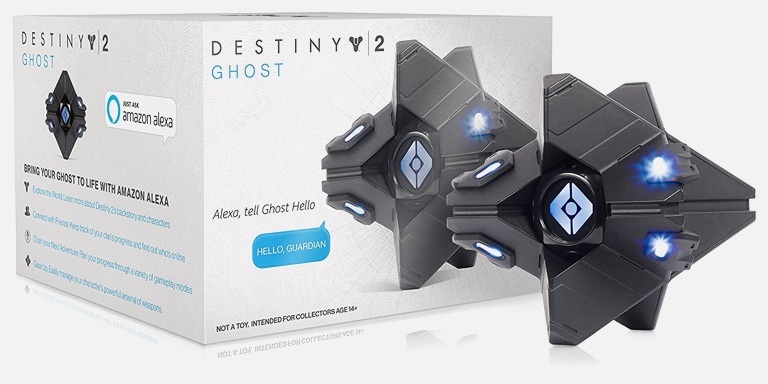 As a huge fan of the Destiny franchise, I was honored to work with Bungie to define utterances and responses for the skill tree, work through device (Ghost) interactions, and explore back-end solutions to enable skill interactions between the Destiny game and the Ghost device. AccoladeThe Destiny Skill ended up winning a Silver Lion Award in the Digital Craft Lions – Innovative Use of Technology category at the 2018 Cannes Lions International Festival of Creativity. 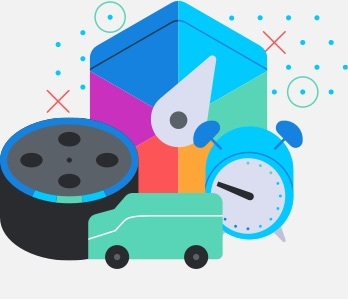 Alexa Gadget Marketing Pages To help creators discover and learn more about Alexa Gadgets, and generate leads, I worked closely with the Gadget’s marketing team to write copy and layout our Alexa Gadgets marketing pages. 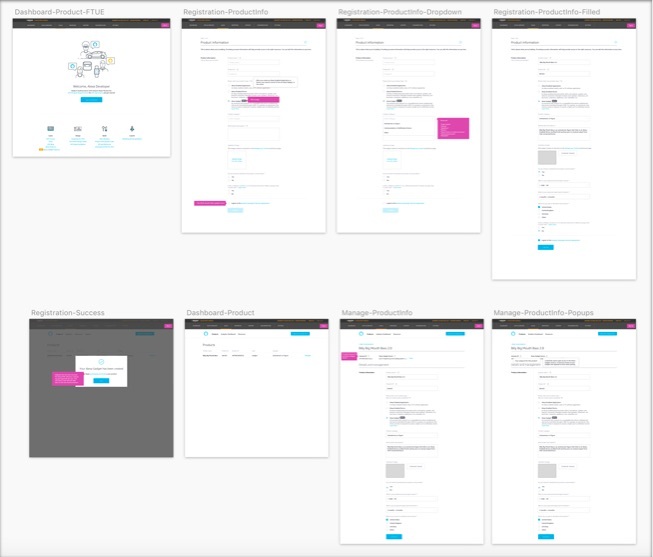 I leveraged Alexa’s visual design library to ensure consistency with other Alexa programs, and I created new visual assets, background images, and iconography, which were added to the overall Alexa design library. Gadget Skill API The Gadget Skill API is an interface that allows a skill to communicate with an Echo Button. Although not a heavy exercise in visual design, this required me to maintain very close collaboration with both the Skill Store designers and the Alexa Skills Kit Designers. 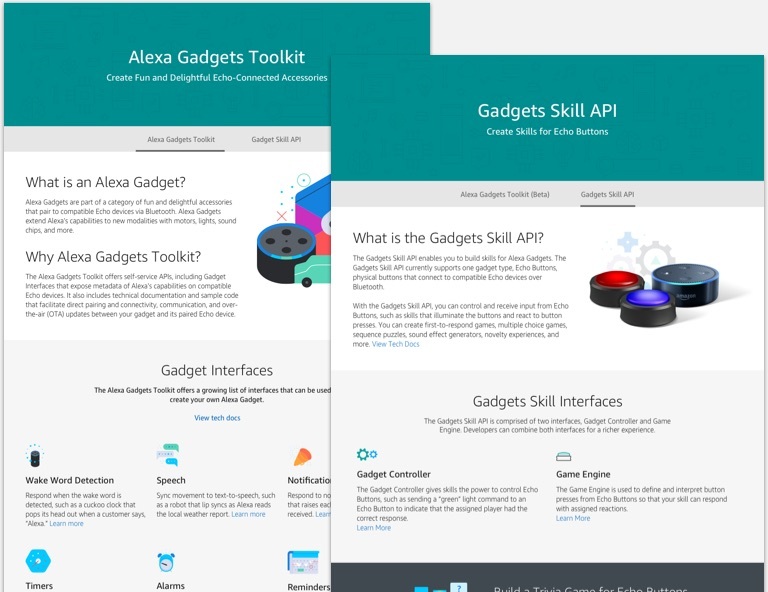 I was responsible for defining the enablement process of the Gadget Skill API through the Alexa Skills Toolkit as well as defining how Echo Button skills would be represented within an Alexa Skill detail page so that customers understood whether or not a Skill worked with Echo Buttons, how many Echo Buttons the skill supported, and how many players could participate. 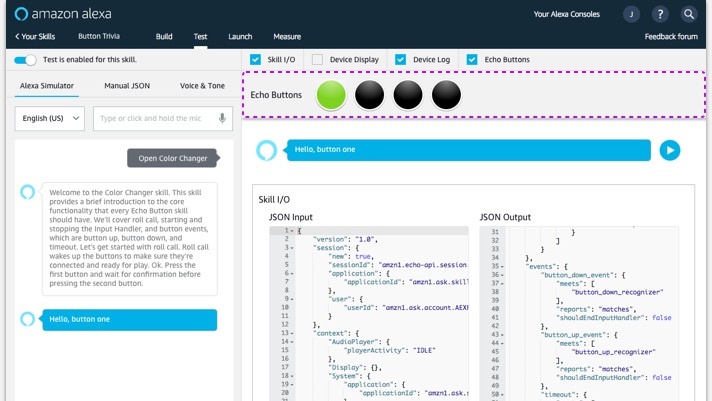 Echo Button Simulator As a part of the Alexa Skill API, I was tasked with designing the Echo Button simulator, which allows developers to simulate any Echo Button Skill experience from within the ASK Skill Builder. Although on the surface this may seem like an easy UI addition, there is vast complexity under the surface that had to be accounted for in the CX. 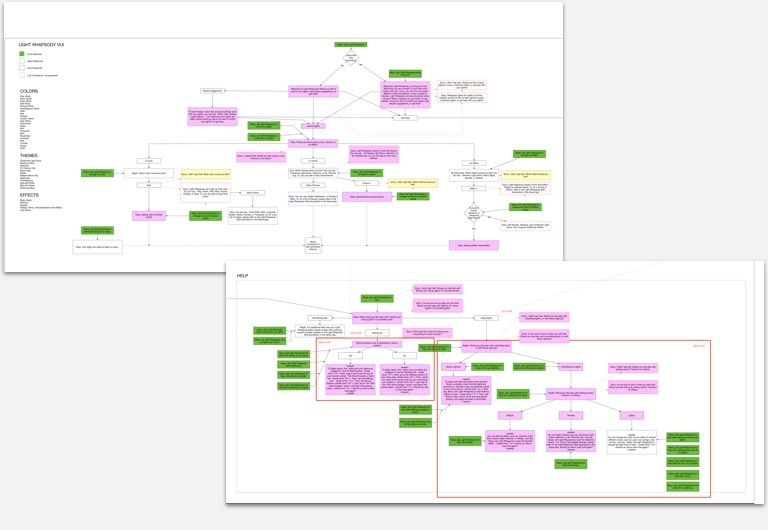 Additionally, making such a drastic change to the layout of the simulator required our development team to re-architecture the codebase to make it more modular. I worked closely with our lead developer for this project and together we were able to sell my proposed changes to the simulator team and help build the changes. This required close collaboration with the simulator team and the Alexa Skills Kit Team. Gadget Registration To allow developers and manufacturers to register a Gadget and gain access to the APIs that allow a Gadget to communicate with an Echo device, I owned the UI integration of Alexa Gadgets into the AVS registration flow. 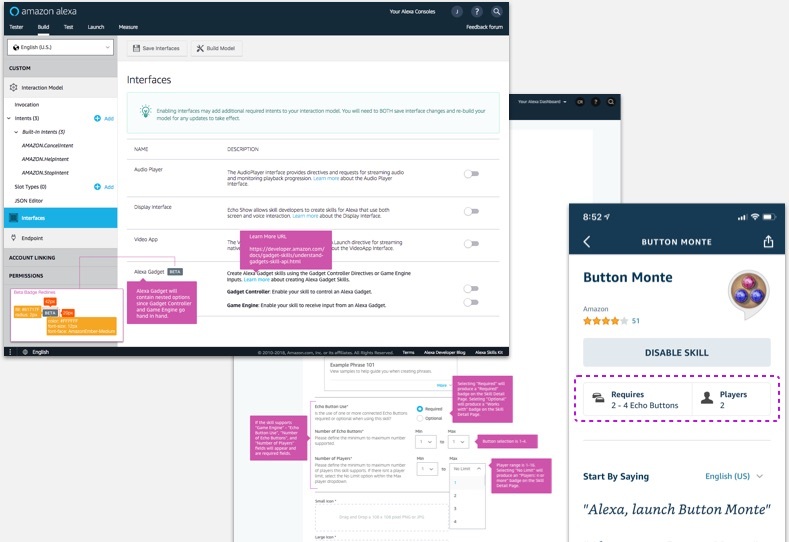 I worked closely with the Alexa Voice Services UX Product, and Dev team to implement the updated functionality and messaging throughout the registration flow. VUI: Light Rhapsody Light Rhapsody, our first Gadget developed by an external manufacturer, Gemmy Industries, was a strand of smart lights that could respond to the beat of a song and that could be controlled through a skill. I was responsible for designing the Voice User Experience for this skill. The design of the voice experience was a complicated project, which involved designing a VUI that would enabling users to setup their lights, summon different themes, colors, and effects, and get help, if needed. I worked hand in hand with Business Development, Product, and our solutions architect to deliver this experience.